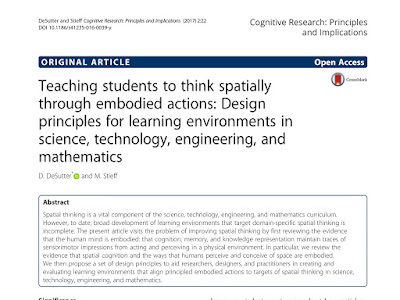 Spatial thinking is a vital component of the science, technology, engineering, and mathematics curriculum. However, to date, broad development of learning environments that target domain-specific spatial thinking is incomplete. The present article visits the problem of improving spatial thinking by first reviewing the evidence that the human mind is embodied: that cognition, memory, and knowledge representation maintain traces of sensorimotor impressions from acting and perceiving in a physical environment. In particular, we review the evidence that spatial cognition and the ways that humans perceive and conceive of space are embodied. We then propose a set of design principles to aid researchers, designers, and practitioners in creating and evaluating learning environments that align principled embodied actions to targets of spatial thinking in science, technology, engineering, and mathematics. Click on image to enlarge. Article link.